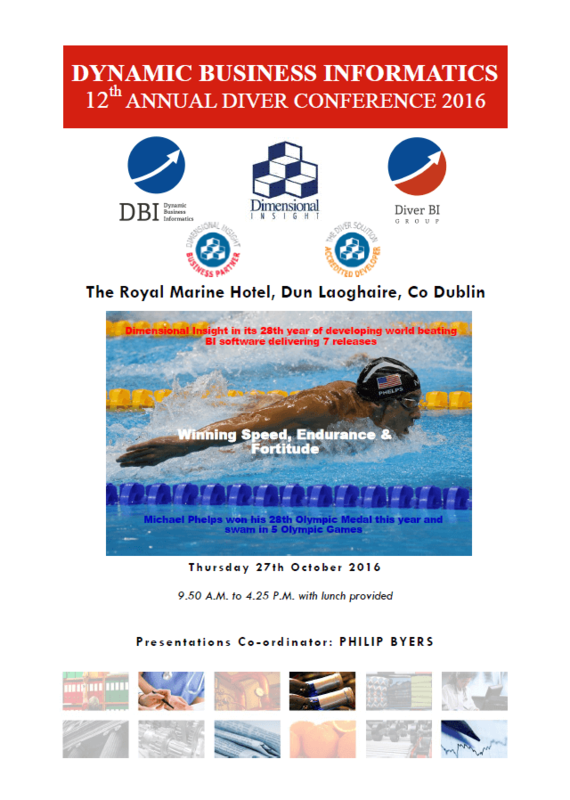 We are delighted to be publishing the agenda for our 12th Annual Diver Conference which will take place on Thursday 27th October 2016, at the Royal Marine Hotel, Dun Laoghaire. We will be privileged once again to welcome Fred Powers, CEO of Dimensional Insight who will kick off the conference with his key note presentation on the DI Road Map and State of the Industry. He will be joined this year by one of DI’s Senior Software engineers, James Kirtley, who will be sharing the latest information on DI technology. Corrib Oil; PRL Group; LeisureGrow; Woodies; McLoughlins RS; Pallas Foods and Tony Kealys, plus a guest speaker Brian O’Mahony who will be opening our eyes to some Visual Cognitive Science! Read more details in the Agenda…. Please let us know as soon as possible if you wish to attend this Diver BI event.